If you’ve been reading my blog, you know I’m a skeptic. If you haven’t been reading for a while, welcome! Hi, I’m Elizabeth Drake, romance author, Gen-Xer, and skeptic. One thing promulgated in most women’s magazines, beauty blogs, and general female knowledge is that to have attractive skin, a woman must cleanse, tone, use a serum and moisturize every day, twice a day. Some of you are wondering what this stuff even is. Cleanse – wash your face, usually with something other than water. Never soap. It supposedly is too harsh and dries out the sensitive skin on your face. Though why it’s okay to dry out the rest of our skin, I have no idea. Tone – This is supposed to help sweep away impurities, cleaning pores, making pores less noticeable, and protecting skin. Yeah, not sure how it’s different that cleansing above. Not sure what’s wrong with pores, either. Moisturize – You add moisture back into your skin to fight wrinkles. Because heaven help us if we don’t look forever twenty. Especially if you’re a woman, though companies are starting to target men, too. Why leave 49% of the population on the table when we can try to convince them they have a problem so they’ll give you money to fix it. Sorry, that was the Gen-X gene coming through again. All in, I’m assuming this is all stuff to give us that awesome “glow” that you see on so many magazine covers. Except, that’s not what they really look like either, and these are professional models. I’ll save the Photoshop rant for another time. And, if you do get this picture perfect skin, I’m not entirely sure why you’d then put make-up over it. Tons of make-up advice starts out with making sure you have a good skin care regime. Clearly, I’m too cynical to be their target demographic. And yet, they got me on the cleanse, use a serum, and moisturize. As I was applying my dye free, scent free moisturizer, after having had properly cleansed my skin and given my serum time to soak in, I noticed my skin was tight. Clearly, I needed to moisturize. I even had a trouble spot I had been super moisturizing for months because it was so dry. Then I thought back to before I started using moisturizer. I was younger, certainly, but my skin had never needed it. Even when I started using it, my skin hadn’t really needed it. 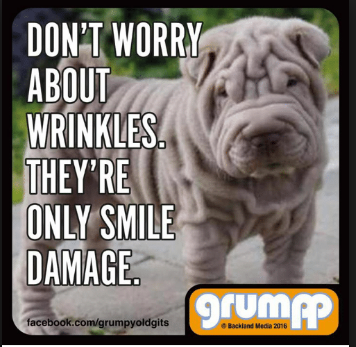 I was doing it for wrinkle prevention. I decided to look and see if it’s possible for skin to become dependent on moisturizers. This is going to shock you, I know, but yes, it can become dependent on moisturizers. Chronic use of moisturizers tells your skin to stop making the sebum that naturally protects it. 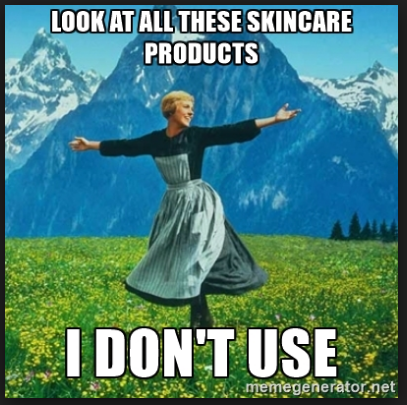 Not only that, but many of the ingredients in moisturizers actually promote dry skin. You know, so you’ll keep using their products. Because of course they do. While I love research, sometimes it really stretches my faith in humanity. Other doctors claim that oil, including the stuff our skin naturally makes, isn’t great. It’s water itself that makes our skin glow and feel moist. Our skin stores this water in structures called glycosaminoglycans (GAGs), and the water is then sealed into our skin by the top layer of skin called stratum corneum. This upper layer produces natural moisturizing factors (NMFs) — amino acids, urea and lactic acid. You’ll notice these same ingredients on skin care products, and they’re supposed to help keep skin soft, protect it from UV light, maintain the skin barrier that keeps the water in the GAGs, and regulate the skin’s natural exfoliation. Problem is, all these natural processes supposedly break down If you artificially saturate the barrier layer with moisture. This tells the skin to stop producing GAGs and NMFs, which means thinning skin, less water in the skin, and the appearance of fine lines. In addition, some doctors believe moisturizers reduce the skin’s ability to slough off dead cells, create an oxygen-free environment that acne bacteria love, and clog pores which leads to more acne and rosacea. Yeah, sounds exactly like what people were shelling out huge amounts of money for the skin care products to prevent. The doctors in the article I linked to above recommended a skin care regime that eliminated moisturizers, but add a chemical exfoliator. This is supposed to get rid of dead cells and help kick-start the skin making its own NMFs and GAGs again. I went to trusty Amazon, and the number one rated product had over 7,000 reviews and was still at an average of five stars. It was pricy for an experiment, but I decided to risk it. I figured you can’t buy 7,000 reviews and not get caught. I got it two days later, because that’s how Prime rolls, and I tried it out that night. It was runny, and it was dye free, scent free, and clear. It had no real smell at all, and at first I thought I might have gotten suckered and bought fancy water. But, I followed the directions and got it onto my skin, let it sit for a minute, then gently rubbed it in circles for another minute before washing it off. My skeptic wanted the British doctors to be wrong so I could gloat here. But after one use, my skeptic had to hush. The dry patches I’d been struggling with for six months are gone. My skin is softer than it’s been in a long time. I’ve been using it twice a week for a little while now, and it’s done more for me than my standard routine ever did. I’ll stick with it for now, and I’ve learned to listen to that skeptic. She may not always be right, but she’s wrong less often than you’d think. How about you? Ever find yourself following a routine even if it might not be working? 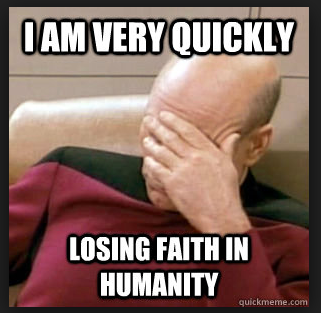 Your faith in mankind ever challenged by some product or service that causes the harm it’s supposed to prevent? Any insight into moisturizers, toners, serums, or exfoliators? Maybe some research I’m missing? Interesting, isn’t it? You regime totally works for you, and I bet it’s 1/10 or less of what they get so many women to spend. A part of me wonders why it’s not okay to look our age. Why we have to be striving to look like we’re twenty forever… I like who I am now a lot more than the twenty-year-old I was.